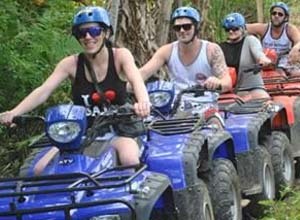 Bali ATV Ride is one of the best Bali Activities of riding a powerful semi automatic 250 cc Quad Bike in central of the most stunning countryside Ubud. The trek will be through the rice terrace, plantation, bamboo forest, jungle, river, villages and spectacular panorama. We have long trek in natural environment, it's very cool and picturesque panorama that will take you to an amazing experience riding on all terrain quad bike with long and challenging trek that are not monotone. It's safe and suitable for beginner and professional so come and ride with us. It's time for you to try out our challenging trek to pampering your adrenaline. Back to the nature and have fun that you will not regret and forget the adventure experience tours. Bali Zoo Elephant Expedition is one of the most popular Bali Elephant Ride Park packages from Bali Zoo offer exciting activity in the Bali island.